The Woolworth’s five-and-dime store is now a civil rights museum. Fifty years ago this Sunday, on Dec. 11, 1961, the United States Supreme Court reversed the convictions of 16 black college students who had been arrested in a civil rights demonstration in Louisiana. It was the high court's first decision regarding sit-in protests throughout the southern states. The students had been arrested in the state capital, Baton Rouge, where they were refused service in two racially-segregated restaurants. After they defied police orders to get up from their seats and leave, they were charged with disturbing the peace. 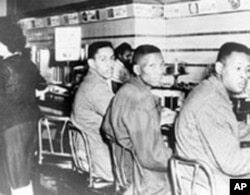 Four North Carolina A&T College students, including Ronald Martin (left) and Robert Patterson, were arrested for sitting at a Woolworth’s lunch counter in Greensboro, North Carolina, in 1960. Sit-ins had become a tactic of the civil rights movement in 1960, the year before the Supreme Court ruling, when other black students sat at the previously all-white lunch counters in the Woolworth and Kress variety stores in Greensboro, North Carolina. They were denied service and ordered to leave. When they quietly refused, police were called, and the students were arrested on charges of trespassing and creating a public disturbance. Sit-ins, or sit-downs, had been used by striking workers worldwide for years. But the idea was new to the civil rights movement. The sit-in in Greensboro inspired a wave of similar tactics throughout North Carolina and then other southern states. Many restaurants were desegregated in their aftermath. Three years after the Supreme Court ruled sit-ins to be lawful, the U.S. Congress passed the Civil Rights Act of 1964, which included a public accommodations section that barred racial discrimination by hotels and restaurants. The Woolworth store in Greensboro - where it all started - is now the International Civil Rights Center & Museum.